"Combining history and criticism, this study of textile crafting highlights its social and political aspects. . . . Discussing current crafting trends within the context of globalized mass production, Julia Bryan-Wilson examines art—such as the unravelled-velvet 'blacklets' of Angela Hennessy—that physically deconstructs fabric as a means of commenting on the meaning craft practices have for black women and other marginalized groups." "Julia Bryan-Wilson's book goes beyond arguing for fiber’s aesthetic legitimacy to demonstrating its political agency. And she does so by considering an enthralling range of hitherto untapped material: fantastic costumes designed by the 1970s queer theater troupe, the Cockettes; hand-sewn tapestries produced by Chilean artists depicting torture under the Pinochet regime; and the still-growing NAMES Project AIDS Memorial Quilt. Ms. Bryan-Wilson’s research is more than substantial, but her propulsive style makes the book a page-turner." "A vividly written, cleverly designed, and conceptually challenging examination of textile arts. Julia Bryan-Wilson is brilliant at the close reading of objects as well as characterizing work and her experience of it. Her many threads of argument include efforts to escape the binaries of high and low, professional and amateur. Taking on a medium outside the usual realm of art history, she asserts that textiles are contingent and shifting, and that they extend from bodily knowledge and require alternative forms of discussion." Bryan-Wilson's method of close reading produces numerous points of contact and intersection between otherwise vastly different fibre-based objects, processes, objectives, and social and political contexts, allowing the reader to see beyond entrenched categories and divisions. Unexpected overlaps between conceptual art and materiality, feminism and queer craftiness, folk art and fine art, soft diplomacy and activist resistance, frivolity and seriousness, to name a few, punctuate the text, prompting the reader to question why we buy into the hierarchical distinctions between things, people, and practices in the first place. "Academically well-researched, critically insightful, and bolstered by dozens of historic photos, from braided floor pieces to Chilean arpillera tapestries to the AIDS quilt, the case for using handwork to illustrate and raise consciousness about oppression is well documented in Fray. What often comes to the fore is the power of people sewing and crafting together to draw attention to common concerns." "In Fray, Julia Bryan-Wilson explores how political worlds are made and unmade through craft. She patches together the neglected histories of the ‘handmade’ objects of feminist, queer, trans, and Latin American artists and activists and reveals alternative forms of making in exciting and focused detail. It is a vast and ambitious book with rigorous research promising to expand conceptions of textiles and identity politics both geographically and thematically." "It is difficult to characterize this vast and ambitious book, but not its achievement, which is magnificent. In short, it will be received as a model of rigorous research, seamless organization, clarity of exposition, and utter persuasiveness. It will set standards of quality for topics beyond craft and textile studies. Indeed, within its pages are examples for art and cultural historians of all periods and media of how to articulate the ever-challenging project of revealing the ideological dimensions of art in terms of very specific historical and political contexts." "Bryan-Wilson’s groundbreaking approach is rigorously attentive to the moment in which she is writing, considering recent literature and artistic practices, while describing the broader, often overlooked historical and cultural backdrop against which these more current examples operate. If her topic is ‘craft,’ or more precisely, ‘craftivism’—a demarcation that allows the author greater reflexivity—Bryan-Wilson brilliantly utilizes this subject to zoom both way out (examining, for instance, urgent questions around the politics of representation) and way in (offering remarkably close readings of particular objects).... Whether Bryan-Wilson is researching in an archive, conducting a personal interview, or utilizing the unstable space of the web, she articulates how her findings are affected through the means by which she obtains them." 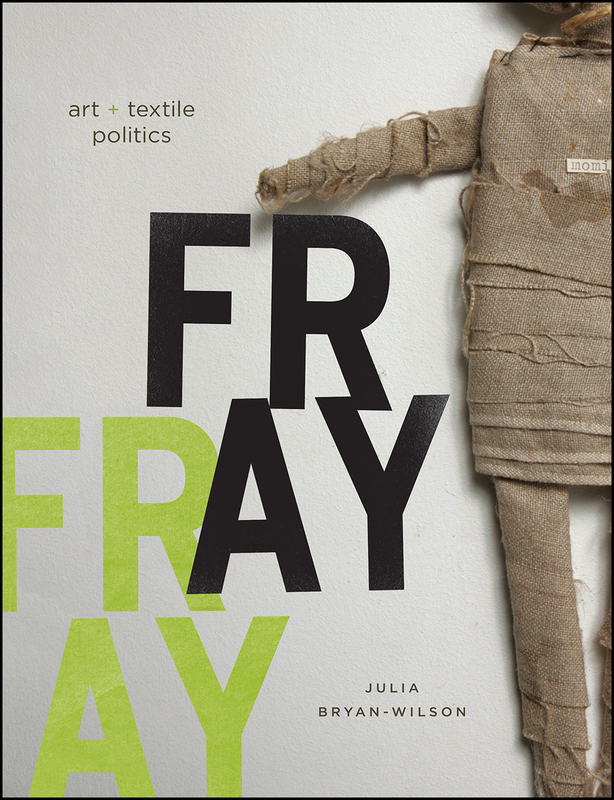 "Fray, Julia Bryan-Wilson's brilliant and compelling new book, explores how political worlds are made and unmade through craft. Her research and analysis of the 'hand-made' objects of feminist, queer, trans, and Global South artists and activists reveals alternative forms of knowing, imagining and crafting in exquisite detail. Astonishing!"